An image combining two disparate political decals has caught the attention of social media users. Most of the interest in the image seemed to be of the “Is this real?” form — that is, inquiring whether someone is actually vending Trump campaign decals like the one seen above. 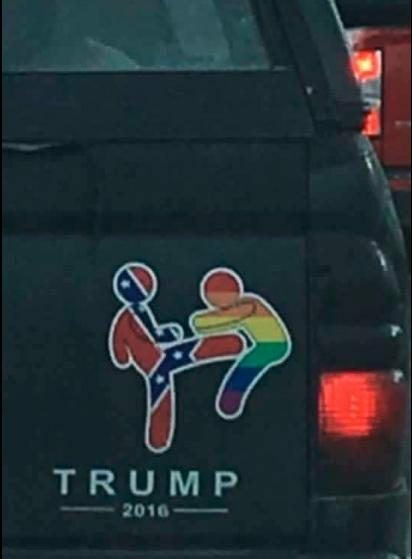 From what we can tell, it appears someone has combined two different commonly available decals to make a larger (and some would say disturbing) political statement. Combine the two, and … well, brief social media fame. As far as being a literal political statement, this image doesn’t seem to have much to do with specific Trump campaign positions. Championing the display of Confederate flags (a controversy that flared in mid-2015) hasn’t really been a position espoused by Donald Trump, and the Republican nominee’s stance on LGBT rights has been inconsistent, to say the least.